I know where your head is at. Clams… they have shells… they swim in the sea… err.. or, lay in the sand… they can be slimy and fishy and well… weird. I get you. I totally get you. Which is why I made you this pizza. We’ve already established that I have tons of favorite things. I mean… tons. If you even think I’m exaggerating just take a peek at the archives and you’ll inevitably pull out a “favorite” every four recipes or so. Approximately. Because that clams casino linguine is easily one of my favorite dishes in this giant universe of pasta and seafood stuff. And it’s one of yours too. At least that’s what you tell me. So… I made you this pizza! Oh. I also ate clams casino pizza at the beach last week. Well, not at the beach as in, I’m sitting on the beach and eating clams casino pizza. No… that just wouldn’t mesh. Sun, sweat, bikinis, pizza, sand… not a great combo. Unless you like to eat sand pizza in your bikini. If you do… you’re weird. And I like you. But I ate clams casino pizza at a restaurant at the beach. And it was nothing short of… tremendous. I could sit here and tell you how fabulous it was with it’s gooey cheese and caramelized onions and crispy crust and blah blah blah, but I think you should just make it for yourself. Right? Plus, it has bacon. If that doesn’t make this the favorite pizza of every person in the universe then I don’t know what will. Ah. Mistook you for my husband there. Apologies. If you live somewhere close to the shoreline, 1. I’m jealous and 2. you could totally use fresh clams. I think. In a large bowl, add warm water, yeast, honey and olive oil. Stir and let sit until yeast gets foamy, about 15 minutes or so. Once yeast is foamy, add 1 cup all-purpose and 1 cup wheat flour and salt to the bowl. Mix well until a ball forms, then continue to mix with your hands until a ball forms. If dough is too sticky, add remaining flour. If too dry, add water 1 teaspoon at a time. Flour your counter and knead dough 20-30 times with your hands. (I also have used an electric mixer to make this dough.) Lightly oil the same bowl, add the dough back in, cover with a towel and set in a warm place to rise for 1 1/2-2 hours. Once dough is ready, flour your counter again and use a rolling pin (or a bottle of wine!) to roll dough in to a circle, or shape of your choice. Heat a large skillet on medium-high heat. Chop the 4 raw slices of bacon and add to the skillet. Cook for 3 minutes (no longer), just so a bit of fat is rendered. You do not want the bacon to be crispy at this point. Remove it with a slotted spoon and set it aside in a bowl, then turn heat down to medium. Add in onions and peppers with a sprinkle of salt, and stir. Cook for 5 minutes, continuously stirring. Add in garlic and cook for 3 more minutes. Completely drain clams, then add them to the peppers and onions along with half of the bacon. Cook for 2 minutes. Remove from heat and add a few shakes of hot sauce. Brush olive oil over pizza dough evenly and sprinkle with italian seasoning. Sprinkle dough with 4 ounces of mozzarella. Spoon clam/pepper/onion mixture evenly over pizza, then top with remaining mozzarella, parmesan, and the rest of the bacon. Bake for 25-30 minutes or until cheese is golden and bubbly. If you can’t help but be reallllly creeped out by the clams, I surmise this would be fantastic with shrimp, chicken or… just the plain vegetables. If you like that sort of thing. I don’t like clams. But this pizza is the definition of perfection if it was made with something other than clams I would probably be in love. I need to make this with something other than clams, and it better look as amazing as this! The cheese is the perfect shade of golden brown. Exactly what I was going to say. It’s not even about the clams…God – the pizza is golden just the way it should be! I love linguine and clams but have never thought to put them on pizza! Never had clams casino…Sounds good, though! I used to get an awesome clams casino pie from a place near where my grandparents lived. So delish, but couldn’t remember what was on it! I’m not a fan of bell peppers…think I can sub anything for them? Or can I skip them all together? I’d probably just skip them, not sure what else you could sub… ? Maybe you could add shrimp as well as the clams to beef it up a little?? I love clams and I love pizza. Looks like this is going on the list of things to make soon!! Beautiful pictures, as always! I’m sold! I’m sold! This sounds utterly delicious….now to make it without telling the kiddo what is ON it! ;) Shhh…. I’m DROOLING at my desk. Could also be because I skipped lunch, whoops. But more likely because I want this. Delivered in front of me. Now. Have I mentioned clams and I are BFFs? Well, my tastebuds and clams. So experimental! At least it would be for me. Clams in a can. That’s new. 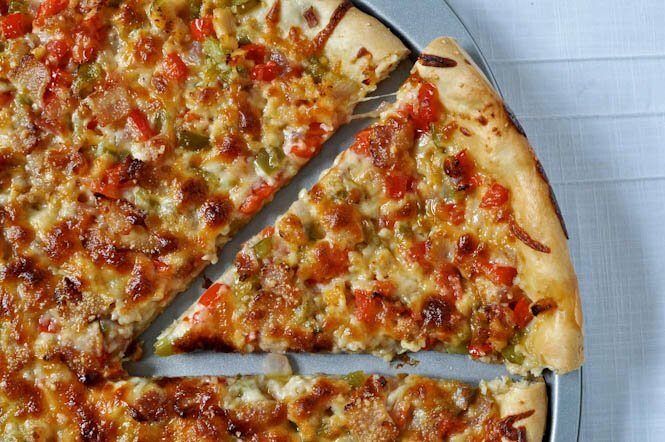 That pizza looks delicious – and this is coming from a vegetarian! I don’t usually say this because it’s said so often that it’s lost some of its meaning – but I literally do want to eat my screen. This pizza looks insane! I want to bite into it like right now. And I’m a HUGE clam-phobe. Actually anything from the sea that inhabits a shell – phobe. But for this pizza, I may just have to get over my phobia. Gorgeous photos. I want to eat the photos! I don’t understand why I have never used tabasco with pizza before…but now I will. My next project: Crab Cake Pizza. Yeeeeuhhh! WOW! That pizza looks amazing…. I know what I’ll be craving when supper comes around…. Thanks. What a unique yummy twist on pizza. This looks SO SO fabulous. Oh my! that looks delicious, I’ve made a pizza dough with basically the exact same recipe, except without letting the yeast get foamy, and waiting only 30-40 mins for it to rise before rolling it out, the result was delicious but very puffy, and i was after more of a crispy thin base, does this recipe and method give a thinnish, crispyish base? I think the reason it comes out this crispy is because this pan is rather large and it is a small portion of dough, so the dough is stretched thin. I have also used this recipe as a free-form dough and it does get a bit fluffier. I think I might have to pass on the clams. (Blegh) But I am always on the search for the perfect dough recipe and the honey in this one intrigues me. I can’t wait to try the dough for our next pizza! my boyfriend would kill me for mixing cheese and fish(one of *those* italian kids, lol). the inclusion of clams would literally kill me and my sister(allergic)…the base veggie/cheese/bacon mix though–this seems pretty damned solid. i think i’m gonna give it a fish-free whirl. thanks for posting this! I lovelovelove clams. My brother would probably hate me forever if I made this for fam dinner tomorrow, but I don’t care. This pizza sounds fabulousss! I’m allergic to clams….but the pizza looks amazing!! Your pictures are so cool! Oh my goodness watch my mouth water!!! :) I’m totally going to make this when I’m brave enough to deal with the crust. this looks absolutely divine. Home baked pizza is always, ALWAYS, better than shop bought. I have been reading your blog for awhile now but never commented. Just wanted to say that I made your red velvet cookies recently and then this pizza last night The cookies were to die for and this pizza was seriously out of this world. Thank you so much for the amazing recipies! This looks fantastic. I was looking for a claims casino pizza recipe for a buddy who owns a pizza place near us. He’s making it for Sunday’s (1/22/12) football get together at the tavern attached to his restaurant. I’m providing him w/a gluten-free crust and asking him to make this especially for me. Can’t wait to try it! I just want you to know I’ve made this pizza THREE TIMES in the last WEEK. I’m a little bit obsessed. And tonight I’m making your delicious creamy caprese pasta for the second time in two weeks. I love you. And your recipes. But mostly you. THANK YOU FOR EXISTING, and for sharing your amaaahzing recipes with us! This looks amazing, but I can’t help thinking it’s missing Ritz Crackers which is such a part of traditional clams casino (which my mother made for every party we hosted during my childhood). Maybe incorporated into the crust? i used pillsbury pie crust and completely forgot the hot sauce . other than that, followed the recipe. i’ve made a lot of pizza’s and this was by far one of the best pizza’s I’ve ever made. wow!!!! You didn’t mention the size of your pizza pan, please let me know.